Sign up and you will immediately receive an E-mail to access Red Rhino Electrical Estimating Software. To develop an electrical bid and to estimate the cost of a project, it is necessary to know exactly what materials need to be installed. Your material take-off must be a complete and precise list of materials that are to be installed in a given project. The project drawings will show you what goes where. Use the drawings or blue prints and make a list of all material items. Highlight every item as you count it, so that you do not count items twice. If the electrical bid requires that you install a 112.5 KVA transformer, you may need a fork lift to move the transformer from the delivery truck to its installation location. On your take-off, you would include dollars for fork lift rental and labor hours to move the transformer from point A to point B. Also, you would include wire lugs and hardware, special mounting hardware for wall mounted applications and of course line and load side conduit and wire, plus conduit, wire and a ground clamp for transformer grounding. Click Below to See Video How to Estimate Transformers. If the electrical bid requires that you to run underground conduit; it would require trenching, back-fill and compaction. On your take-off, you would include rental dollars for the trencher and wacker / compactor, plus the labor hours required to perform the work (There would also be a fuel expense). When installing large cable or wire you would include labor for terminating the cables. When you have completed the list of materials you enter them in to electrical estimating software program and it spits out the labor hours that it takes to install the material and the material cost. In order to be systematic with your material take-off, it is necessary to do the material take-off in a certain sequence. First - Prepare - There are a few steps that you must take prior to starting the material take-off. What is Scope of Work? Second - take off Vendor items - First take off the items that come from a vendor/supplier and that require quotes. Take-off switchgear, panels, transformers, motor control centers. Take-off generators, transfer switches, fuel tanks, UPS systems, PDU systems, ect. Light and power outlets, HVAC and plumbing connections, misc. connections. Site utilities conduits, pull boxes, manholes, trenching. Third - Notify suppliers - Let your vendors/suppliers that need to come in and do their take-offs or make arrangements for them to get the information. 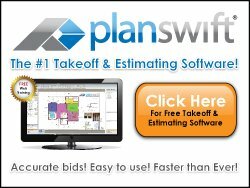 This will allow you to schedule them in at the right time and not disrupt your estimating work progress. Make sure the vendor/supplier gets all the information pertinent to their scope of pricing. This will prevent misunderstandings about what they are to include or exclude from their quote.